Lovemore Bros are always proud to be given the opportunity to do yet another successful lift for our regular client and leaders in the supply of automotive parts, Brace Able. 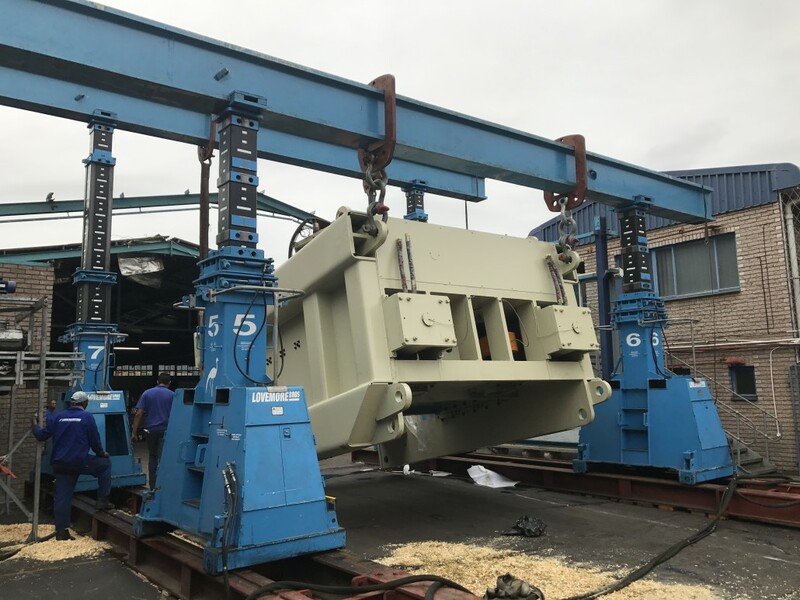 Despite unfavourable conditions, Brace Able’s new 96 tons press was safely moved and positioned on time by the Lovemore Bros Heavy Rigging team. Prior to the rigging of the job, the roof section of the rigging path had to be taken off to accommodate the size of this machine. “The biggest challenge was getting the 100ton lowbed into position. We had to negotiate a very tight turn down the driveway to get the lowbed into position for offloading,” says Avikar Chabalalsing, Heavy Rigging Supervisor for Lovemore Bros. The Lovemore Bros gantry was set up around the load and once offloaded the press was then topped and tailed into an upright position. “The rigging set up of the gantry was also precise as the space to set up the gantry was very limited. 10Ton by 13m long header beams had to be rigged onto the gantry first to accommodate the 96ton load,” says Avikar. 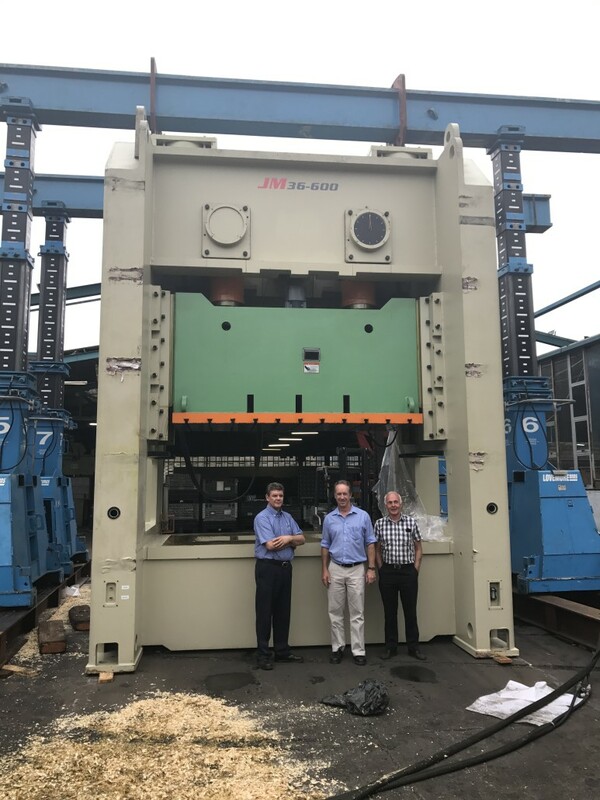 The press was then carefully driven into the factory by the gantry and offloaded onto Lovemore Bros’s specially made turntables to change the orientation of the press. 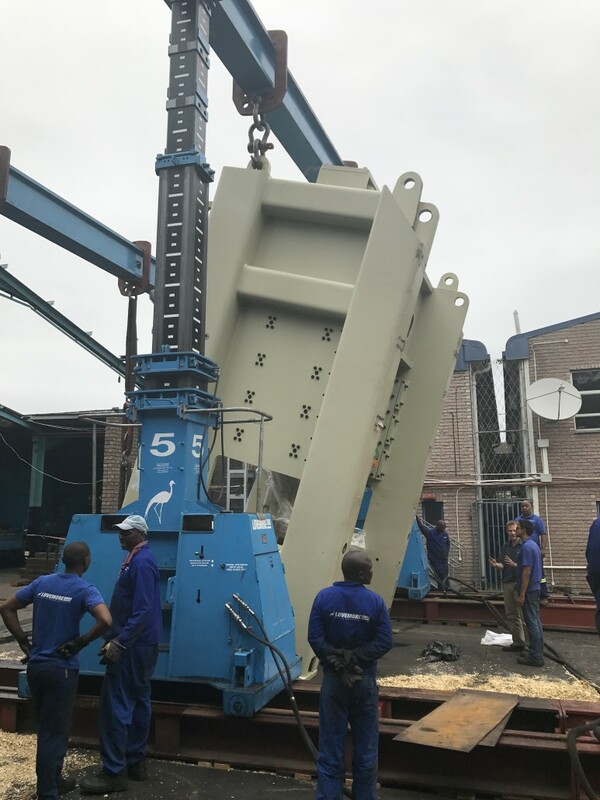 These turntables made it possible for the team to change the loads direction of travel where it could then be positioned and levelled with gantry awaiting installation and commissioning. “The job was a great challenge – rigging 96 tons has its own characteristics as to how the load behaves, with ground condition as one of the many important factors to consider and extra precaution was taken to ensure the load was moved into position safely. The Lovemore Bros teams worked hard and long hours to ensure the press was in its position on time despite the challenges of weather,” says Avikar. Established in 1988, Brace Able has been the leaders in metal pressings and welded assemblies for 29 years and have a dedicated Engineering Division with Tool, Die and Jig manufacturing capabilities which can take products from design stage right through to delivery.